Inspired by Edward, the Black Prince of Wales and Aquitaine, this beautiful decorative blade features Celtic inspired etching and a golden tone hilt embellished with the shield of the prince and the motto of the Order of the Garter. 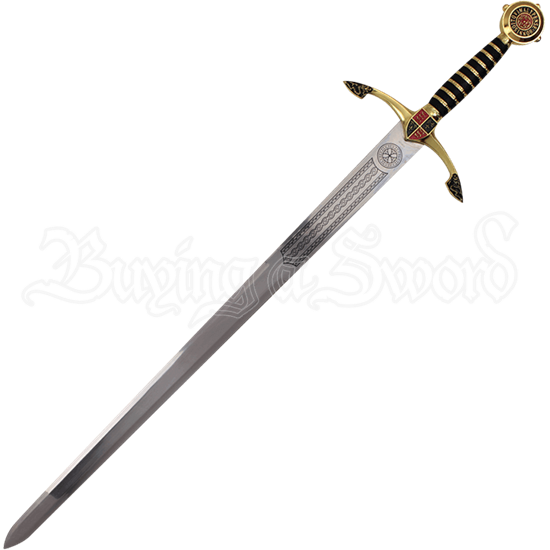 Made of stainless steel, the blade features its Celtic knotwork detail upon its ricasso, up next to the crossguard. The shield of Prince Edward appears in colorful detail at the center of the guard, the arms of which curve towards the blade with colored panels decorating their tips. Golden colored bands stripe the black hilt of the sword, which is followed by a round pommel. A red flower appears at the center of the pommel, surrounded by the phrase Honni soit qui mal y pense, the French motto of the Order of the Garter. With an included wooden wall plaque for easy display, this historical replica sword makes an intriguing addition to medieval home decor, themed displays, and weapon collections.